Please read before submitting forms! "Thank you" first of all for wanting to attend this function. The event is a yearly function of America's FIRST and the world’s largest and most elite grandmasters/ masters organization (see our testimonials/ historical media documentation links). It marks the 22nd year of our existence! – You can expect a great time with the seminars, exhibits, camaraderie with “real” martial artists and our awards banquet celebrating the awardees for 2014! – GM Sanchez, Founder/ Executive Director In’tl – WHFSC. 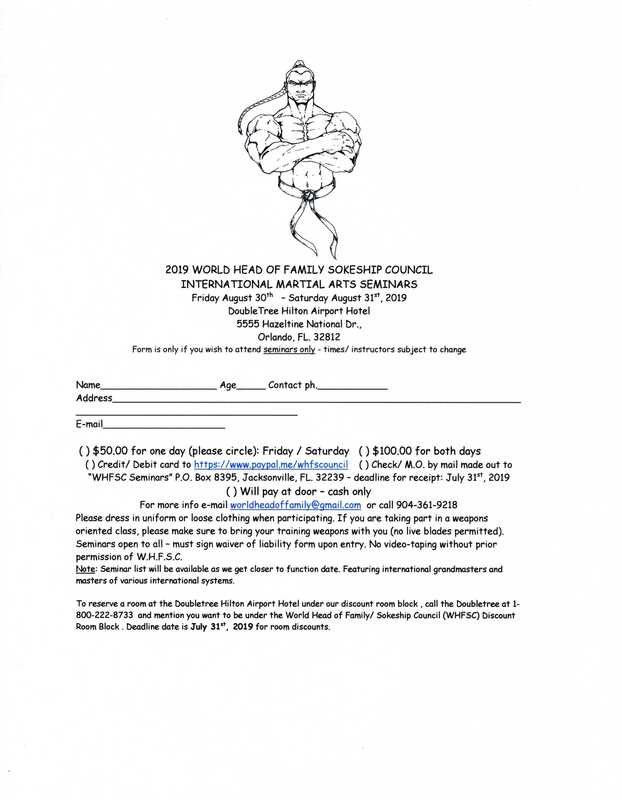 Room reservations under our discount room block of “World Head of Family Sokeship Council” (WHFSC) are AVAILABLE NOW with the DoubleTree Hilton Hotel in Orlando, Florida. Call 1-800-327-2110. The deadline is May 20, 2014 to reserve your room(s) under our discount room block for our June 20th – June 21st , 2014 22nd Anniversary event of the WHFSC. If you wish to just attend our International martial arts seminar symposium/ annual meeting and Hall of Fame banquet without being recognized for an award, you can simply just fill out the banquet form on-line and return it to us with your remittance. Otherwise, submit your nomination(s) for approval first then wait to receive an o.k. from us. If the nomination(s) have been approved we will send a pre-filled banquet form for you to submit your remittance with. NOMINATIONS FOR AN AWARD - If you are nominating someone for an award or would like to be considered for an award, please use the nominations category list and nominations form to send in your nominations or you can simply write them down and send in (preferably by e-mail). ALL nominations will be screened to see that the individual qualifies for the award, so it would help to send in some references as well . Your nominees will be contacted by e-mail once they are approved and will then be instructed to submit their fees for the banquet. Unfortunately, since the hotel bases its charges for the awards dinner banquet on the number of seats filled and not on whether the individual is an adult or child, there is no discount for children attending our event. If you would like to go to the seminars only featuring international grandmasters and masters and not attend the annual meeting or awards banquet– just fill out the seminar application form and remit payment per the instructions on the form. The seminar leaders names will be released as we get nearer to the function date. If you will be flying in to this event, we would suggest checking on-line at www.fly.com for flight savings. If you are from a foreign country and need a letter to be sent to the U.S. Embassy in your area to come to the United States. Let us know a few months ahead of your planned meeting with the U.S. Embassy, so we can make sure the letter arrives in time before you have your interview. Give us the mail address of the U.S. Embassy to send the letter to along with a contact to address it to, if you have someone the letter should specifically go to. Please also remember to give us your complete name, personal address and passport number. The letter will be sent by U.S. mail only and not by courier service. Please check with us regarding theme park discount ticket availability. If you cannot be at the event and would like to accept your award, let us know when making your remittance. There is no discount out of fairness to those who will be attending in person and allow 2 to 3 weeks for receipt (foreign destinations may take longer). Comic relief! - As an ecstatic Professor Gary Dill receives the Council's first ever "Golden Hatchet" Award for "taking care of business while maintaining a positive outlook on life"